Get your permit and get on your way! It’s that time of year when people are getting bad news: no matter how many times you apply for a reservation for a wilderness permit, the hiking gods seem to be against you. That can be discouraging but, remember, there is another way. Forty percent of the quotas for each trailhead are held for people who “walk-up” to the appropriate Wilderness Center the day before they want to begin hiking. If you are willing to suffer a bit, you can win at this game and secure the permit you want. The first question is this: are you hiking alone or with someone? Alone is the toughest (you’ll see why), but if you didn’t possess a certain amount of toughness you probably wouldn’t be interested in the hike. Step 1: before you leave home, grab a 3 x 5 card and write your name on it in large print, with a felt marker. Really…trust me on this. Stick it in your wallet. Step 3: ask several people who work in the Wilderness Center how the lines have been in the morning, and how early people have been lining up. I wouldn’t put a TON of stock into this, but it’s good way to establish a minimum. If, for example, you’re told that there are always twenty people by sunrise, arriving at 8:00 a.m. is probably not going to work. Also, find out when the center closes (it sometimes varies). Step 4: walk or take the shuttle to where you are going to stay that night (campground, Curry Village, Lodge, Ahwahnee) and get settled in. Step 5: return to the Wilderness Center just before closing and ask again. Someone may have canceled. Step 6: Here’s the tough part: decide when you are going to get in line. The last time I did this I got there at 2:50 a.m. and was the first. The second person arrived at 3:01 a.m. By sunrise there was more than a dozen. With the popularity of the JMT, the earlier the better. My advice would be, if you are traveling alone, buy a cheap folding chair at the valley store, get a good book (and a book light), and get there as early as you think you can tolerate. It will be a nuisance, but here’s the thing: you will have forgotten all about your unpleasant, sleepless night by the time you get to Nevada Falls. You want to be the first in line. (If there are two of you hiking, split the duty, and get there no later than 10:45 p.m. the night before.) A couple of other tips: time it so you arrive at 45 minutes after the hour. Most folks are going to plan to arrive on the hour. By getting there fifteen minutes early you can get ahead of everyone who shows up fifteen minutes later. Second, if you’re alone, be careful not to OVER hydrate (at least until someone else shows up to hold your spot while you take advantage of the rest room). Turn and walk out of the center. I’ve never witnessed someone cutting in line, but I’ve heard that it happens. Be on lookout for guys who wander in at 10:45, loiter for fifteen minutes, and then walk up to the counter for a permit. Step 8: when you get to the counter, know what you want. There will probably be 2 or 3 Rangers talking to hikers at the same time, handing out permits. You don’t want the more decisive person behind you to use up all the LYV Pass Thru quotas while you are dilly-dallying. Keep in mind that if you get in line Tuesday night at 10 p.m., for example, it will be for a permit that gets you on the trail THURSDAY morning. At 11:15 Wednesday morning, when you leave the Wilderness Center with exactly the permit you want, you still have the rest of the day to recuperate from your overnight adventure in sleep-deprivation. 1. An unforeseen problem that is affecting everyone near that trailhead (e.g., a fire, a government shutdown, etc.). 2. You didn’t get there early enough (or were caught sleeping at the center by the wrong Ranger and were tossed out of line). Great advice Ray. I will be trying to get a walk up permit in August. I’ve got a permit for Happy Isles to Illioutte Falls but would really not want to backtrack. I think it will be worth the trouble to get the Happy Isles permit, instead. Lots of people dislike that first stretch, but I have to admit to really liking it. I usually reach Nevada Falls by mid-morning; it’s one of my favorite break spots! Thanks for the comment. Another tip: sleep on the porch 🙂 No joke, I literally slept on the porch last time and was automatically first in line. The last time I was there the Rangers really had a great system. As soon as they got there they rounded everyone up and explain the system to everyone. They talked to everyone who was there waiting for the 11am permits and basically got everyone’s permit situation figured out by 9, so all we had to do was wait the 2 hours to purchase them and get on the way. It was very orderly and well run. Another tip: listen to their bear stories! They are epic! Interesting comment, Conrad. I’ve been warned by Rangers NOT to fall asleep, but there may be some new rules in effect. There is absolutely no question that the Rangers are your greatest asset when getting your permit. Be sure to listen carefully. Thanks! There’s also a great chance that you can get a same day permit. This happens when there’s a cancellation. We got in line at the Wilderness Center at 12:00 AM the night before, barely got any sleep, and ended up on the trail by 2:00 PM that day. Good thing we had a night in LYV; I don’t think I could have hiked thru on so little sleep. Thanks, Brian. Very true. That why I recommend going directly to the wilderness center when you arrive to see if anything is available. Raymond I already have a permit but will be waiting in line with my brother who will be joining me. My permit is from Gp leaving on tues 07/22. We pllan on getting in line early monday morning around 2 am. To get ky brother is permit for tues. Does this look like a sound plan to you. tks for any advice you can give. If you want a permit for two people, do both people need to be at the Wilderness Center? Or can one person obtain the permit and the second person arrive later that day? Thanks for your great webpage and advice! Nope…just one of you need to be there. Thanks for the nice comment regarding the blog, Trinka! Can I pick up a permit for two people, hike to LYV solo, and have my hike partner meet me there the next day? That probably isn’t technically within the rules. People on the same permit are supposed to hike together, otherwise, how could a Ranger properly check for a permit? (Oh, my buddy has it!) Your friend’s period of vulnerability would be from Happy Isles to LYV. If challenged for a permit, he would not have one. He could say that you hiked ahead (which is true). The Ranger might just accept that, might note your friend’s name and check it against a list of permit holders later, or might turn him around. Good luck! Ray thanks the write up! Do you see any problem with securing FOUR spots out of happy isles to LYV by spending night in line? We and my three children will have to leave around July 3rd (also a busy time I would expect). Are half dome permits also give out in the same process? Four quotas are possible, but it becomes even more important to be first or second in line. You’ll be competing for the twelve spots given to “walk-ups” for LYV. I believe the rule is no more than six per permit. I’m afraid you are in for a long night. Caffeine is a wonderful thing! Thanks! Do you know how half dome tickets work? Sorry! Forgot to address that, although I don’t have an unambiguous answer. My understanding is that if you ask for a Half Dome notation on your permit you will get one. Enough quotas are held back, allegedly, to allow those with wilderness permits that go by Half Dome to make the trip. I’ve also been told that some Rangers interpret the rules differently. Your best bet might be to call the wilderness center. Nice article – thanks Ray! I hear there is a backdoor path from backpacker’s site to the Wilderness center.. It is straight point to point? Sorry, Art, I don’t know. Good idea, though! I have a JMT permit with a start date of July 2, 2017 from Lyell Canyon end date July 26 Whitney Portal. Due to the snow situation I would like to start a week later. Could I pick up my permit on July 1 and just start on July 9 instead of starting on permit date July 2. If stopped by a ranger what will happen? Thanks for the question, Bernice. First, I should point out that the blog post, above, is no longer valid. The process has changed since I published this list of steps. Second, a wilderness permit is supposed to be used on the day indicated. It would not be within the rules to wait a week or more later. I certainly understand your concern – I think you will encounter a bunch of snow even if you leave July 9. Good luck. Thanks for the great blog post! Planning to drive from SF early in the morning to be at the Yosemite Valley Wilderness station by 9:30/10am. Hoping to get a pass for the following day. Any idea on the chances of this? The only walk-up wilderness permits to enter at Happy Isles and exit at Donohue Pass are ones that are already reserved, but not picked up. In other words, someone would have had to plan to hike but decided against it. The odds are against you getting a pass like this, but with all the snow this year, the odds are probably a little better than usual. Good luck. Just came across this great article. Since it was written in 2014, would you say all the tips still hold strong? Since I’ve been repeatedly denied from the lottery, I’m trying to get a Yosemite walk-in permit from the Tuolumne Meadows wilderness center to hike the JMT to Mt. Whitney. Do you think getting there by 4am would be enough to get a permit for two people? Any other tips would be greatly appreciated. Sorry it has taken me so long to get back to you; my wife and I were away for a couple of weeks. 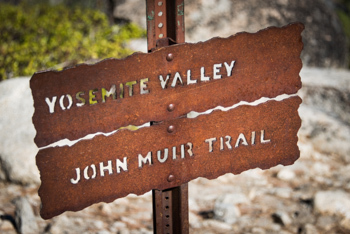 I think the article is still pretty good, although you can’t get walk-up permits in the valley any more for the JMT (it sounds as if you know that). In regards to arrival time, I would think 4 would do it easily, but I have to confess I have no direct experience. Good luck!